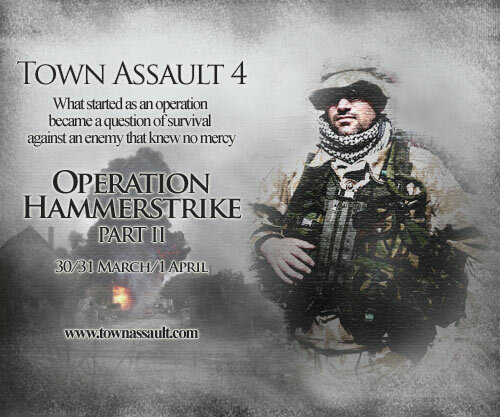 Town Assault is back for a fourth instalment and the concluding part to last years Operation Hammerstrike. So with the last of the rebel resistance about to fall inside the town of Stozkovskiv, the Coalition have very little time to celebrate their victory for approaching the town are rebel reinforcements….and a lot of them. Over the 24 hours that follow the men and woman of the Coalition will be taken to hell and back as they try to repel one wave of rebel attack after another. How long will there defence hold? Will Coalition reinforcements arrive before the town is lost? Be a part of 24 hours of totally immersive action. Following on immediately from where TA2 left off, this event promises to throw you straight in to the action of an unfolding battle. Which side will you give your allegiance to? The rebel insurgents officially known as the Ukrainian Liberation Army. Or part of the Coalition Peace-keeping force providing military assistance to the Ukrainian government? Which ever side you choose; prepare yourself for a rollercoaster ride of action. For Town Assault is no normal airsoft skirmish event. You will have to fight with restricted amounts of ammo and you will be required to work in small squads with a chain of command (sections, platoons and companies). There will be medic rules, POW’s, simulated mortar support as well as fast-air support, and SAM (Surface to Air Missile) launchers to counter them. This is potential the most intense and multi-layered Town Assault event yet. THIS TIME, YOU COALITION DOGS ARE DOOMED!